This has been the gloomiest winter in memory. On Sunday, January 22, there was 15 minutes of sun. I dropped everything and hustled outside so that I could sit on the deck steps, close my eyes and soak it in. All 15 minutes and no seconds of it. Then it was gone. It may surprise some of you that I wrestle with depression. Yes, yes, that positive, chirpy exterior sometimes is a brittle façade. It does not help me one little bit when there is no sun for days, weeks and weeks. I pump up the D3 during winter and eat as much dark green, leafy vege as I can shovel in, but we're barely breaking even this year. Then there was the loss of my 'boy', Scrappy. Even though I knew it was coming and had been bracing myself, the reality is a whole other plane of heartbreak. Still, I am the poster girl for stiff upper lips, so - one foot in front of the other. I manage to keep an even keel by focusing on all the good things - and there are plenty. There are my family and friends. There are my dogs and cats, chickens and ducks, sheep and llama. There is the faith I have that kindness, compassion and honesty will overcome all the anti-light-giving crap that we are currently experiencing. 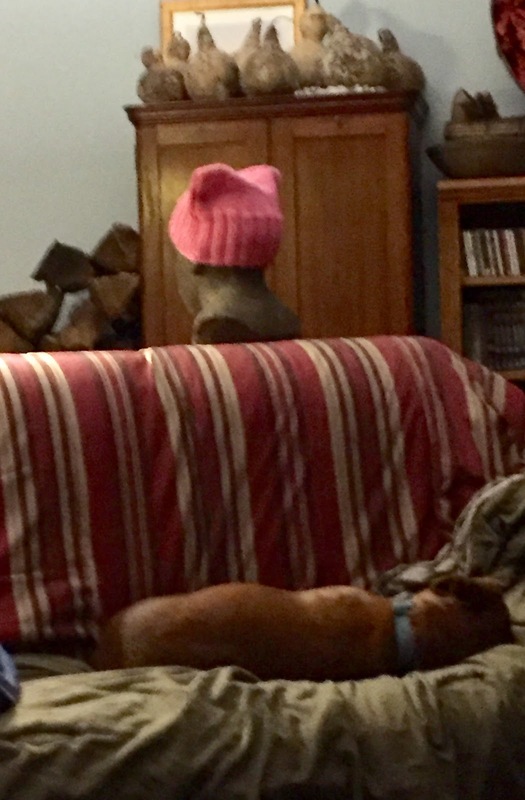 When I need an extra boost, I don my bright pink PussyHat. 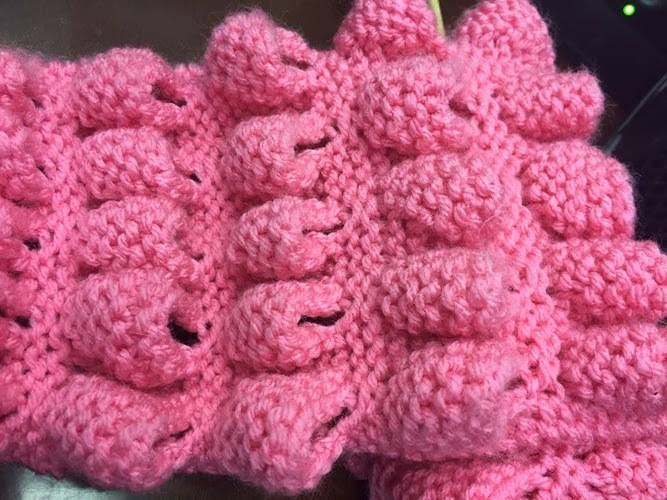 pinkest of PussyHats until it is needed. Speaking of pink... Although I have come to embrace the power of Pink, there is only so much of it that I am willing to clasp. 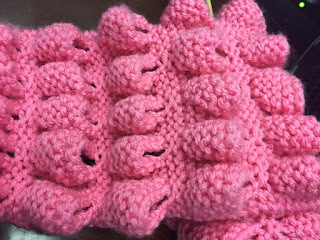 After knitting three hats, I still had quite a bit left of the skein of bubblegum pink yarn - what to do.... We all know that I am adamantly against waste, so it must be used! I think I've come up with a plan. And it involves a giveaway...details to come when it's finished. Bertie continues to make progress. He is a tater tot of a baby hippo, with the most endearing folds and wrinkles under his chin. Gah. I do have to keep reminding myself that he is still a puppy, even though he has an old man's face. Lovey was also two when she came to me, but she was a whole nuther banana. This one is very self-confident, has extremely limited focus and was born to chew. I managed to rescue an ill-placed hiking boot before it was unwearable, and I have been finding most all of my mittens, ear warmers and scarves outside. Until he gets the house rules under his belt/collar, Bertie is crated when I am not around him. It works well, as he needs to be kept quiet for a while until his kennel cough is better. Bertie is gradually meeting the rest of the inhabitants - he met Linden through the fence, nose-to-nose. It's Linden's duty, as Head Sheepie, to check out all newcomers. He took a sniff, snorted and did a hasty retreat. Bertie barked his head off. There are crows and squirrels. There are chickens. There are ducks. There are crunchy treats. As we work him into our routine, there have been some 'bumps'. When I get home from work it is dark (surprise...not). I let everyone out of various crates, put my boots on (careful to put my work shoes on the table), then we all pile out of the back door and out into the chicken yard. While Lovey was never brave enough to squeeze through a dark, open chicken door, Bertie has no such qualms. I managed to snag him before he was totally inside. I left them to run around while I went in the person door and checked for eggs. There is no light in the coop, with the exception of my headlamp. I left the coop, shut the door and headed over to the duck house and closed them in. As I walked toward the deck, I heard some kerfuffle from the coop - nothing new there. I called Bertie. And called. And called. No Bertie. (Sound of the other shoe dropping) Coop!!! I beat a hasty path to the coop and there he was - having silently slipped in behind me - with chicken in mouth and one on the floor. OMG. I shooed him out and checked the hens - both were alive but damp and more than a bit traumatized. I put one hen in a nesting box so she could recover and the other hopped onto the roost, apparently no worse for wear. In the morning, both were fine. He is not a vicious dog, but he is very BUSY. While there is definitely more work involved, now that Bertie is one of us (the hall rug must be scrubbed this weekend, shoes and boots are no longer handy by the door), he is definitely worth it. I am hoping to get a video (then garner enough technical skills to upload it to the blog - haha) of the two dogs playing. It's like watching a baby hippo on a mad trot, chasing a gazelle. Potato Leek Soup is on this weekend's menu - leeks were sliced and frozen from my organic bonanza at the best farmers market EVER in South Portland, ME. I'm having a friend over for dinner on Sunday, so I am fishing out a small turkey breast, making mashed potatoes from my stores, and creamed corn from my frozen corn. I've got lots of bits and bobs in the freezer that I need to use up, so this week's meal planning should be fusion at its weirdest! 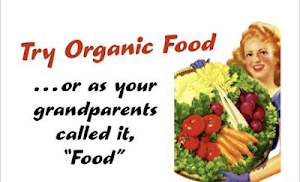 LHIB - Yes, they are! I'm a big believer in the Stiff Upper Lip myself. Debra, it beats the heck out of the alternative, IMHO. Busy busy as usual. The soup sounds marvelous! We must have traded weather this year. We typically have a full winter of dark, gray, rainy days. This year however, we received a full week of beautiful snow and several bright, sunny days. It does wonders for my mood & reminds me that spring WILL come again. I'm so happy that you & Bertie found each other! Janis, we usually get a snow storm, then it passes, the sun comes out and brilliantly reflects off the snow. Not this year - it's been nothing but rain, sleet, ice, icy fog. After our initial 2', it's been all downhill. Bertie is a sweet patootie! You're not fooling me. You don't have TIME to feel depressed! Bertie sounds like one great big puppy . . . which I guess he is. Sorry, but I had to laugh at him sneaking into the hen house. Just another spot in his new home he had to check out. Seriously, I do know how debilitating S.A.D. (or anything close to it) can be. I'm very fortunate I'm not negatively affected by rain, sleet, ice, fog, etc. as that's just the weather we're having. And we didn't even have the 2' of snow you did! The sun will come out. We will have more snow. Winter isn't over yet. I just know it. Hugs, my friend. This year has been tough. TG for D3. My seed catalogues keep me going, that and clearing brush and turning compost although I talk to myself while doing all three, is that a bad sign? I took my laptop in to the repairers 2 days ago-blank screen-rather superior guy pointed out the chewed wire.... Hang in there kid and oodles of hugs to all the furry ones and your lovely self. Oh the joys of owning dogs! We have two rottweillers, both girls, and both exceptionally gentle dogs, but when things need to be chased, like the sheep or chickens, they are ever so willing to help! Hope your SAD condition lifts soon....when I used to live in the UK I used to get quite poorly with it, but when we moved to SW France, the condition eased up, thank goodness. our sun finally came out this morning after a long absence! Potato Leek is my FAVORITE - I may have to make that soon! Hey Sweet Susan!!! I had no idea you wrestled with depression. I'm wondering if it has something to do with the change in the weather(cold, damp, gloomy), and it being dark so early in the day living up north?? When I lived in Virginia it was always cold, and gloomy outside, and when winter came I was depressed. Once the sun came out, and it wasn't so darn cold, and gloomy I felt so much better. Having your animals, home, and garden must help you through these times. Potato Leek soup...sounds yummy will you share the recipe? Bertie is at that inquisitive age, he's going to get into everything. Maybe you can find a job for him on your homestead, this may help with slowing him down a bit. Susan, Bertie sounds like he will keep you on your toes for some time to come. While I don't battle depression, I do find that if I feel down, a quick walk with Nelly clears my head. Of course I don't have to deal with the weather conditions that you have. And, I do believe that light & more light helps. The soup sounds delicious & I'm sure the rest of your meals will be on the creative & delicious.